A collapsed lung happens when air (pneumothorax), blood (hemothorax), or other fluids (pleural effusion) enters the pleural space, the area between the lung and the chest wall. The intrathoracic pressure changes induced by increased pleural space volumes reduce lung capacity, causing respiratory distress and gas exchange problems and producing tension on mediastinal structures that can impede cardiac and systemic circulation. Pneumothorax may be traumatic (open or closed) or spontaneous. 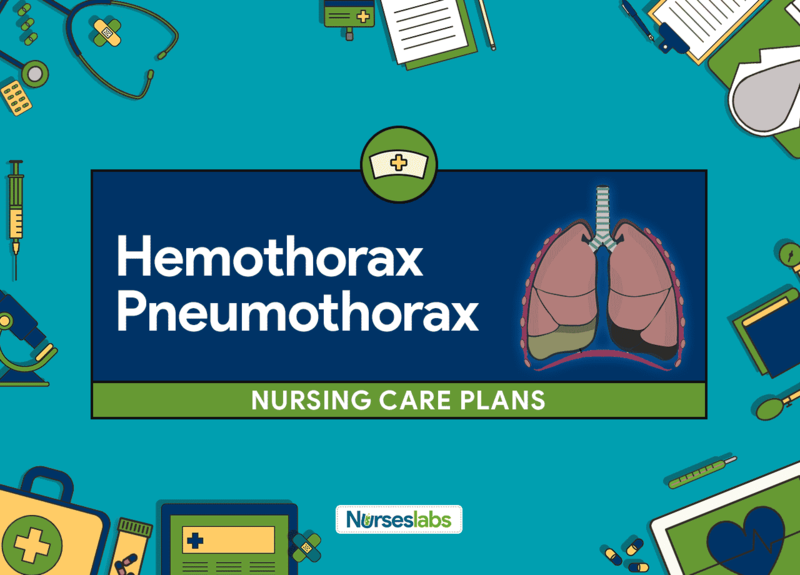 Nursing care planning and management for patients with hemothorax or pneumothorax includes management of chest tube drainage, monitoring respiratory status, and providing supportive care. Risk for Trauma: The state in which an individual is at risk of accidental tissue injury (e.g., wound, burns, fracture). Recognize need for/seek assistance to prevent complications. Correct/avoid environmental and physical hazards. Explain with patient purpose and function of the chest drainage unit, taking note of safety features. Information on how the system works provides reassurance, reducing patient anxiety. Advise patient to avoid lying and pulling on the tubing. Reduces the risk of obstructing drainage and inadvertently disconnecting tubing. Identify changes or situations that should be reported to caregivers such as a change in the sound of bubbling, sudden “air hunger” and chest pain, disconnection of equipment. Timely intervention may prevent serious complications. Anchor thoracic catheter to chest wall and provide an extra length of tubing before turning or moving patient; Prevents thoracic catheter dislodgment or tubing disconnection and reduces pain and discomfort associated with pulling or jarring of tubing. Secure tubing connection sites; Prevents tubing disconnection. Pad banding sites with gauze or tape. Protects skin from irritation and pressure. Secure drainage unit to patient’s bed, stand or cart placed in the low-traffic area. Maintains upright position and reduces the risk of accidental tipping and breaking of the unit. Implement safe transportation if the patient is sent off the unit for diagnostic purposes. Before transporting: check the water-seal chamber for correct fluid level, presence or absence of bubbling; presence, degree, and timing of tidaling. Ascertain whether or not chest tube can be clamped or disconnected from suction source. Promotes the continuation of an optimal evacuation of fluid or air during transport. If the patient is draining large amounts of chest fluid or air, the tube should not be clamped or suction interrupted because of the risk of reaccumulation of fluid or air, compromising respiratory status. Observe thoracic insertion site, noting the condition of skin, presence, and characteristics of drainage from around the catheter. Change or reapply sterile occlusive dressing as needed. Provides for early recognition and treatment of developing skin or tissue erosion or infection. Observe for signs of respiratory distress if the thoracic catheter is disconnected or dislodged. Pneumothorax may recur or worsen, compromising respiratory function and requiring emergency intervention. Nursing Care Plan: The Ultimate Guide and Database – the ultimate database of nursing care plans for different diseases and conditions! Get the complete list! Nursing Diagnosis: The Complete Guide and List – archive of different nursing diagnoses with their definition, related factors, goals and nursing interventions with rationale. Matt Vera is a registered nurse with a bachelor of science in nursing since 2009 and is currently working as a full-time writer and editor for Nurseslabs. During his time as a student, he knows how frustrating it is to cram on difficult nursing topics and finding help online is near to impossible. His situation drove his passion for helping student nurses through the creation of content and lectures that is easy to digest. Knowing how valuable nurses are in delivering quality healthcare but limited in number, he wants to educate and inspire students in nursing. As a nurse educator since 2010, his goal in Nurseslabs is to simplify the learning process, breakdown complicated topics, help motivate learners, and look for unique ways of assisting students in mastering core nursing concepts effectively.